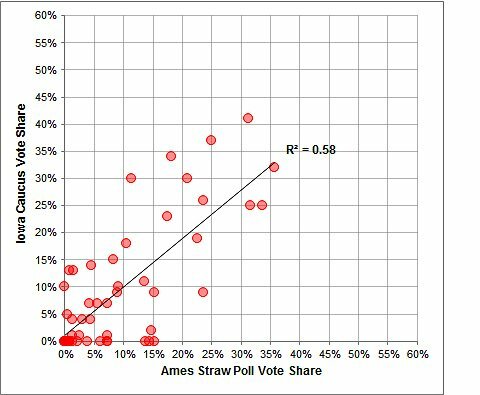 It is easy to make fun of the Ames Straw Poll. It can’t exactly be described as democratic when you — or the candidate hoping to secure your vote — have to pay your way into the polls. But Ames has a pretty good predictive track record. 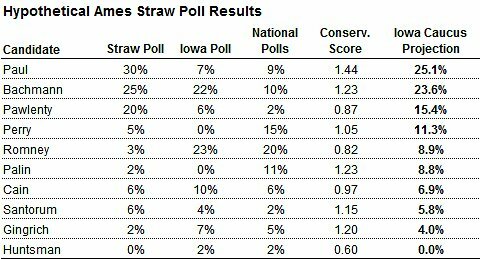 Since the event began in 1979, the candidate winning the Iowa caucus has placed first or second in the straw poll every time. Two successes in particular stand out. In 1979, George H.W. Bush won Ames despite polling at just 1 percent in a Des Moines Register survey — he went on to win the Iowa caucus. And in 2007 Mike Huckabee, in the low single digits in both state and national polls, finished second in the straw poll, the first tangible indicator of his upside in Iowa. There have also been a couple of failures. Phil Gramm tied for first in Ames with Bob Dole in 1995, surprising Mr. Dole who had led Mr. Gramm in a Des Moines Register poll 57 percent to 11 percent. But Mr. Gramm’s candidacy flopped. And in 2007, the third- and fourth-place finishers in Ames, Sam Brownback and Tom Tancredo, dropped out before the Iowa caucuses. But Ames does better than other indicators. 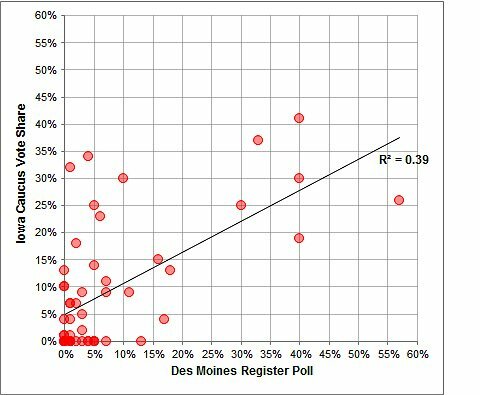 Since 1979, its results have the predictive power to explain 58 percent of voting in the Iowa caucuses. This compares favorably to the most recent Des Moines Register poll conducted before the straw poll, which explains 39 percent of caucus results. 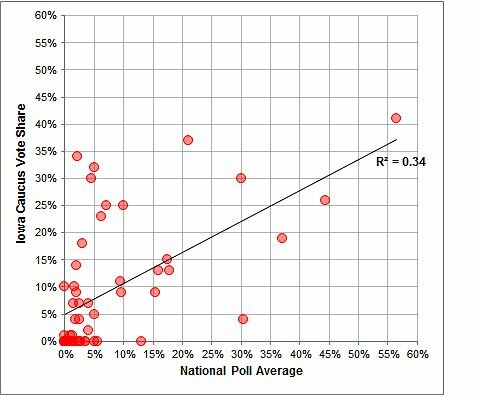 It also does better than the average of national polls conducted in the month before Ames, which explain 34 percent of caucus results. We can also combine these various measures together by means of regression analysis. In addition to the results from Ames, the Des Moines Register poll, and the national polls, I’ve also included a variable for the conservatism of each candidate as based on the methodology of Adam Bonica, a political scientist at Stanford University, who has a smart technique to infer the ideology of each candidate based on their campaign contributions. And I have included a variable for whether the candidate got a “late start,” as indicated by their not having been included in the initial Des Moines Register poll. Before Ames, the best predictors of performance in the Iowa caucuses are a candidate’s standing in the Des Moines Register poll, combined with her conservatism score. (The other variables don’t really help any.) This makes Michele Bachmann, for the time being, the favorite to win Iowa, followed by Mitt Romney and Ron Paul, although the race is fairly wide open. After Ames, the ability to predict the outcome of the caucuses improves significantly — and it’s because the Ames results trump everything else. Once Ames is accounted for, the other variables provide only a tiny, statistically insignificant amount of help. Betting markets think that Mr. Paul is the most likely candidate to win Ames. Say that he does so, with 30 percent of the vote, followed by Ms. Bachmann at 25 percent and Tim Pawlenty at 20 percent. Even if we leave the other variables in the analysis, that would make Mr. Paul the favorite to win the Iowa caucuses based on historical precedent. 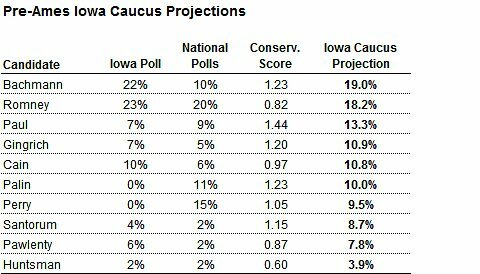 Still, the straw poll is a reasonable simulation of the Iowa caucuses themselves. A relatively low number of Iowans participate, but that is also true for the caucuses, a cumbersome exercise which has notoriously low turnout. A candidate’s financial position might help him to induce people to vote in the straw poll by buying their tickets and busing them to the event — but money also helps to secure votes in a variety of ways when the real caucuses takes place. And a candidate’s willingness to spend time in Iowa is helpful both in the straw polls and in the caucuses. This does not mean that Ames is “important” per se: that a candidate will do well in the caucuses because he did well in the straw poll. But Ames does seem to pick up on a variety of “intangible” factors that don’t show up well in other variables, and therefore serves a useful role as a leading indicator.